You will probably know by now that Lara is out of the cot, in a small bed and that this was beginning to worry me just before Christmas when it dawned on me that while visiting grandparents and great grandparents over the holidays, Lara would no longer be able to sleep in the travel cot. For a while I was stumped, especially after our failures with the 'portable' bed rail but World's Apart came to my rescue just in time. Lara was sent a Peppa Pig 'My First ReadyBed' to try out. This product could not be more perfect for us if it tried! One: Lara loves Peppa Pig. This is fact. Lara's first words (other than 'daddy' and 'doggy') were 'Peppa Pig'. She wears Peppa, watches Peppa, eats Peppa, drinks Peppa and now sleeps Peppa! Two: the 'My First ReadyBed' is a compact, inflatable bed that we can take with us when we take Lara to visit friends or relatives or when we stay in a hotel, B&B or cottage. The My First ReadyBed from Worlds Apart comes in several different themes for little boys and girls such as Waybuloo, Timmy Time, Thomas and In the Night Garden. 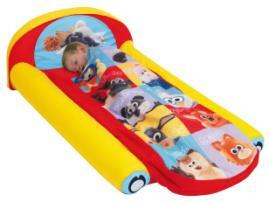 It is a cute little inflatable bed that you can put up almost anywhere and is suitable for toddlers of around 2 years old. The ready bed is really compact when deflated. It comes with its own handy little carry bag and a small foot pump with which to inflate it (Lara thinks it is great fun watching Daddy inflate the bed). It has a small inflatable headrest and a soft integral cover so there is no need for additional sheets or blankets (temperature-permitting). The fact that I don't need to take extra covers for Lara is really important to me because I do tend to forget and Grandparents don't always have blankets and sheets available to borrow. The covers are machine washable, which is a must for a toddler bed. Lara loves her ready bed. We've used it a few times and it is definitely now a replacement for the travel cot. I have even tried letting her sleep on it in our living room for an afternoon nap as these days she can be very stroppy if I try and take her up to bed for a nap in the afternoons. The My First ReadyBed costs around £30-£35 and can be bought from Argos, Amazon or Littlewoods. Worlds Apart also make the Junior Bed which is slightly larger and suitable from 3 years and the Tweeny Bed which is great for sleepovers. 2010 In One Blog Post!